Green tea is touted for its health benefits, and for good reason. The brewed beverage contains micronutrients called catechins, which may help stave off colds and flues while protecting your cardiovascular health. Even healthy beverages sometimes have downsides, however, and green tea can cause side effects for some people, especially in large doses. Like all teas, green tea contains caffeine, and excessive caffeine intake can lead to nervousness, anxiety, abnormal heart rhythm and shakiness. Some people have a low tolerance for caffeine, and they will suffer these symptoms even when ingesting small amounts. High caffeine consumption can also hinder calcium absorption, affecting your bone health and increasing the risk of osteoporosis, a condition in which bones grow brittle and may fracture easily. To help prevent caffeine-related problems, limit green tea intake to five or fewer cups per day. Green tea can reduce the bioavailability of nonheme iron, which means your body is less able to absorb this nutrient. Nonheme iron is the primary type of iron in eggs, dairy and plant foods such as beans, so drinking green tea with these foods may lead to reduced iron absorption. Vitamin C increases nonheme iron absorption, however, so you can lessen the effect by squeezing lemon into your tea or consuming other vitamin-C rich foods, such as broccoli, with your meal. In addition, drinking tea between meals seems to have little effect on iron absorption, according to the National Cancer Institute. Green tea is generally safe for healthy people to consume. If you're on any medications, however, or have any illnesses, check with your doctor before drinking it. Green tea may create problems if you're taking stimulants, hormones, antibiotics, blood thinners, certain asthma medications or any drug that poses a risk of liver damage. 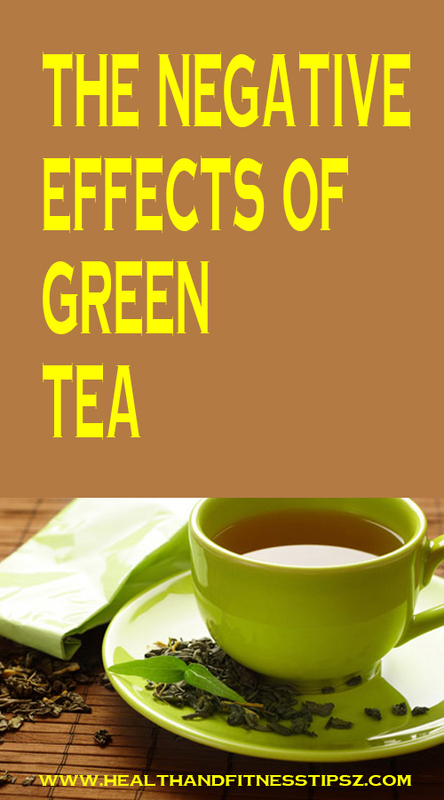 Green tea can also worsen diarrhea, glaucoma, bleeding disorders and multiple other conditions. Although brewed green tea doesn't contain any calories, its diet-friendly status can change quickly if you add too much sugar, honey or agave nectar. Calorie count varies by sweetener, but tack on 16 calories for every teaspoon of sugar you pour into your cup. In addition, bottled, sweetened green teas can be deceptively high in sweeteners and may contain 30 to 80 calories per 8-ounce serving. Even in a healthy beverage, calories count; consume more of them than you burn, and you'll gain weight.